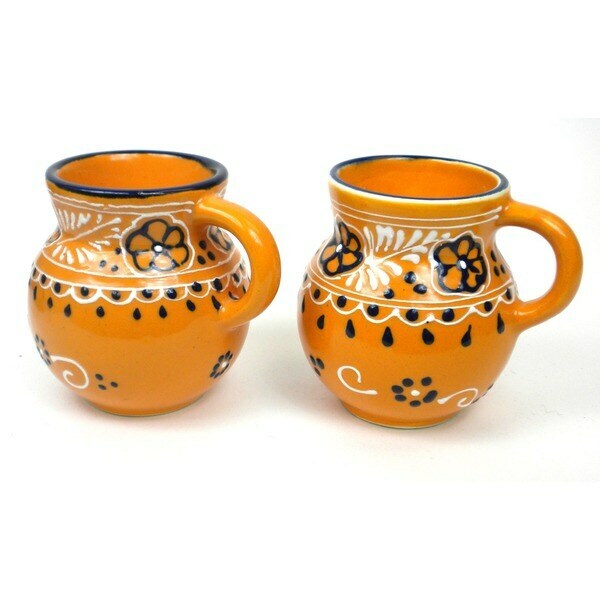 These richly-colored beaker shaped cups are handcrafted and painted by Mexican artisans. While very functional pieces, the outside, inside, and handle are covered with a textured pattern that will make these cups stand out. Each piece has personality from the dots and swirls to the hand painted logo on the bottom. Each one is lead free and microwave and dishwasher safe. Dimensions 10.0 In. X 8.0 In. X 6.0 In. Like the product, it's good one and overstock has unique products,love all the one's which i had purchased so far. I recommend this website all of them who want to have a beautiful house with good décor. These mugs are beautiful I enjoy using them they are special because they are hand crafted.